The Lancastrian Theatre Organ Trust purchased the Methodist Chapel, which would be converted into the Heritage Centre in 2002. 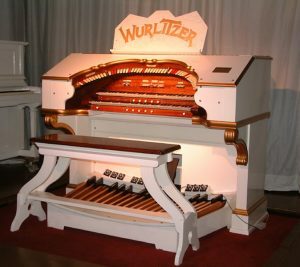 Commencement of works started in 2003, and was completed by volunteers over a three-year period essentially to house a Wurlitzer Organ, but also the many rare and important artifacts, which the trust has collected over 50 years. The lower floor pays homage to Robert Hope Jones with many representations of his early work. It houses two original Hope-Jones Consoles, including that of the first commercial instrument that Robert Hope-Jones built in 1894 when he formed his own organ building company. The museum also houses the World’s first Tibia Dura rank of pipes, made in the early 1890’s. Dura being the Latin for ‘harsh’. Among the Hope-Jones artefacts already collected by the Trust over the years is a reduced model of the organ from St Luke’s, Tranmere. This was the first pipe organ that Hope-Jones played and also the one on which he experimented with some of his early pipe organ ideas. On the ground floor, an eighty-seat early cinema auditorium was created with raised stage to accommodate the organ console. The pipe chambers are directly below, and speak into the auditorium via Wurlitzer pattern horizontal swell shutters. The Wurlitzer Organ (Opus 1664) started life in the Trocadero Cinema in Liverpool, which opened in 1922 with seating for over 1,300 patrons. In 1950 it was incorporated into the Rank Circuit and was renamed Gaumont. The organ (Style DA two manual six rank) was not installed into the cinema until 1927, having been shipped from the factory in June of that year, and was subsequently moved just ten years later to the new Gaumont Cinema in Princes Park Liverpool. The building could accommodate 1,500 patrons and the organ console was centrally placed at stalls level within a small pit area. Later in its life during Rank bingo days, it was moved to the right hand side of the auditorium, directly below the organ chamber. When bingo operation ceased in 1998, the instrument was first moved to Raymond Wallbank’s shop in St Anne’s, before moving once again to the Theatre Organ Heritage Centre in Eccles. Some 21 years ago, the Davenport Cinema in Stockport closed its doors for the last time as a cine-variety house that had been popular for stage and screen entertainment since June 1937. The 1,750 seat house was designed on modernist lines by architect Charles Hartley and featured a ‘Holophane’ living light scheme which allowed the auditorium to be painted in any colour by electric light. The Davenport was a luxury scheme incorporating a fine Compton Cinema organ. 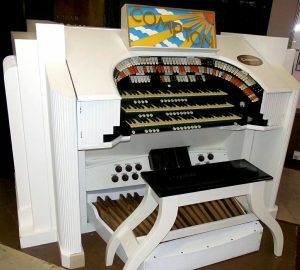 The Compton was one of a small group of organs specified by Harold Ramsey for Union Cinemas, referred to as a ‘Compton Special’. The Davenport instrument, although for a ‘non-circuit’ cinema comprises pipe ranks and components that were clearly destined for installation in other cinemas when the factory ‘A’ numbers was allocated during manufacture. The keyboards and Tuba (Tromba) are marked up A385 planned for the Ritz Nuneaton, the Flute and Metal Tibia for the Regal York, Diapason from the Regal Harrogate and the Tibia polyphones for the Ritz Warrington. The diverse range of originally planned instruments from which the Davenport Compton was derived rather suggests that it was put together in a foreshortened lead-time; perhaps indicating that it was ordered after construction of the cinema had commenced. It is reported that John Compton himself was involved in the order and installation, being acquainted with the Davenport’s owner, Esther Harriet Burns. When installed in the Davenport, the pipe ranks were displaced between two under-stage chambers and comprise – Tibia, Tromba, Flute, String+Celest, Diapason, and Krumet. A separate room contained the Discus blower driven by a 4hp three-phase electric motor and the non-operable (at time of removal) type 2 Melotone unit. Over the last 18 months, the instrument, which has been in storage for over twenty years and relocated several times, has reached its final resting place alongside the Trust’s Wurlitzer in the TOHC. Both instruments are operated through the ‘Uniflex’ system, and can be played individually or together. The Compton has been augmented with three additional Compton pipe ranks comprising Trumpet, Vox Humana and Clarinet and although the Melotone has not been installed at the present time, it is a longer-term aspiration to restore and install the unit at a later date. Recent refurbishment, redecoration and enhancement to the Heritage Centre and the stage area which now contains both organ consoles has well-placed the LTOT for the next ten years of theatre organ preservation.